Today’s strip features James Hines, supported of Kickstarter — helping this strip go forward and the book to be printed, and now leader of Norg-Forth’s Dark Planet Revenge Brigade. Thank you, James! Now, before anyone need point out, “how can they understand him without having worn the translator helmet?,” that is dealt with in the next strip. Just saying. Annnnnd…. an exciting bit of non-fiction science: Voyager is about to maybe sometime soon can’t tell when leave the solar system. First man-made object to do so. NEAT! LARPers? Ghah! I pity Norg-Forth. I’m not sure which will be worse, them, or Dustin. (Tabletop role-player over 30 years, 10+ years with my own campaign world… I’m a geek). all sorts of disaster is certain to follow these new recruits…i look forward to watching the train wreck. Just when I think this series can’t get any funnier, it gets even funnier! Nerds! IN! SPAAAAACCCE! Actually on a more science fictional note, it’s still a bit unclear how Nogg’s computer decided to chose the humans he shanghaied. I wonder what sort of criteria it used to sort out the 6 we know and love from all the seven billion humans on Earth. 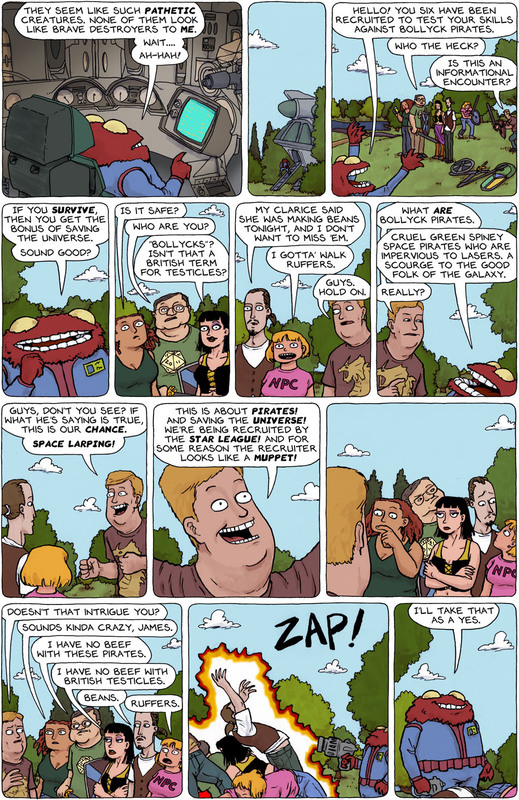 Why, larpers are kind of adept at surviving. Wait, which one’s James? He’s the “beans” dude, isn’t he? @Frank, he’s the leader of the last group. In the 3rd to last panel you’ll see his name used. The least people to do after. What no military “recruits” in his scanner? Is he that naive? Maybe on of them had military training. I don’t see a long life span for these guys and gals. I suggest a funeral before they go out to die. Just so they know how beautiful it is going to be. I want a t-shirt that says ‘NPC’. @Christopher Well, with Latex swords they may be screwed, but if you give ’em the real deal they might just stand a chance. I don’t think any of them really look like Bran or Tink, but one of them reminds me of ‘Trix. Also, the phrase “My Clarice” makes me think of Hannibal Lechter. This group is pretty adorable. i wonder which one will get half her face burned off. *crosses arms* i’m so not getting attached to any of these people! 😀 Well this was unexpected. I am genuinely surprised.